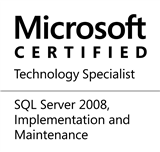 Working with team(s)/team member(s) new to SQL Server is always fun, and helps me gauge the various aspects of SQL Server that I have been taking for granted, but are not so obvious to all. Always use column lists and never rely on the wild-card (*) or implicit column lists. So, one fine day, one of my team members came up to me with a query. He was facing an issue with one of the INSERT statements. He had ensured that all columns were listed in both the INSERT and SELECT statements and also ensured that the number of columns was also matching. Yet, SQL Server was returning an error upon execution of the INSERT statement. Allow me to reproduce this situation with an example. Normally, we would insert data into the table using a simple INSERT statement with a SELECT returning the data to be inserted. However, this team member had the sequence of the columns in the INSERT statement and in the SELECT misaligned, as shown below. Conversion failed when converting the varchar value ‘Microsoft’ to data type bit. The error is not actually misleading or incorrect in any way. What SQL Server is actually doing is to match up the ordinal positions of the values in the SELECT statement to the column listing in the INSERT statement. In this case, the first column of the SELECT statement is a VARCHAR column (Vendor) whereas the corresponding column in the INSERT is a BIT column (IsRetired). Because the two cannot be implicitly converted, SQL Server returns an error. This statement would have generated bad data in our data table – the misaligned columns in the SELECT statement would have gone unnoticed unless someone did a SELECT on the records inserted. When working with column listing for INSERT statements, both the column names and sequence are important! This entry was posted in #SQLServer, Blog, Imported from BeyondRelational and tagged #SQLServer on November 7, 2013 by nakulvachhrajani.